Speaking of measures for counter-terrorism, the mainstream has been the actions taken by security authorities after the incidents actually occurred, and improvement of social and economic problems such as unemployment or poverty, which have been considered to be a breeding ground for terrorism. It is needless to say that such kinds of measures must be continued to be carried out in the future. Nevertheless, the efforts to reduce the wrong “sympathy” felt by youths in any environment to extremism and to prevent the youth to have been motivated to participate in terrorist groups were less considered during the past two decades. In such context, and as one of most successful experiences in adopting a multidimensional approach to combat extremism and to put concrete preventive and proactive actions against terrorism, it emerges greatly the efforts of Morocco in draining its resources, and reducing all non-physical impetuses that might motivate young people to adopt the doctrines of terrorist violence. By reviewing the Moroccan political scene since 2003, it seems that this approach finds its initial guidance in most orientations and speeches of the Moroccan monarch the King Mohammed VI, since his enthronement, reiterating the need to focus on socio-economic issues, such as unemployment problem, regional development gaps between centers and peripheral areas, and the promotion of the culture of democracy, dialogue and tolerance. This trend has been reinforced after the terrorist attack occurred in Casablanca on the March 16th, 2003. 12 youths from the district of Sidi Moumen, poor suburb of Casablanca, attacked the five a luxury hotel, the Jewish community center, and a Spanish restaurant full of foreign tourists. More than 30 people, including eight Europeans, were dead, and more than 100 people were injured . Since then, measures by the Moroccan security authorities for preventing terrorist activities are ongoing increased. Since then, Morocco adopted an integrative approach, targeting the reform of security sector, promoting cohesive developmental panel “National Human Development Initiative . Furthermore, in addition to these anti-terrorism measures generally seen in other countries, Morocco started its unique reform in the religious field; the education of Imams. The objective of this reform is to prevent youth to have wrong “ sympathy” to extremism; If Imams preach the moderate Islam in all the mosques in Morocco, then young Moroccans will understand that the “ sympathy “to Islam of the extremists are wrong but the moderate Islam is correct. Moroccan authority arranged the occasion for Imams of learning Sunni Maliki jurisprudence and Achaari theology on which Islam in Morocco has been founded traditionally and historically, and also promoted the program of literacy classes in mosques in nationwide to raise the general educational levels of Moroccan people. 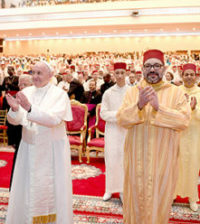 The efforts of Morocco in religious field were highly appreciated by countries in North and West Africa, and several bilateral agreements have been concluded. 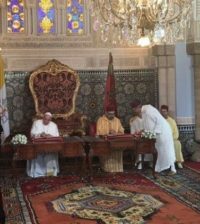 Those agreements concluded in September 2013 between Mali and Morocco mentions the education of 500 Malian Imams in Morocco, and also the foundation of Christian educational center for Catholic and Protestant in Rabat, the capital of Morocco, with target of Christian church leaders in Africa. The possibility to embody the inter-state cooperation through training programs of Imam was mentioned when the king visited Côte d’Ivoire in March 2013. In addition, Tunisia, Libya, Guinea, also from Burkina Faso, requested Morocco to share Moroccan experiences on education of Imams, and the cooperation agreements have been concluded. In Tunisia, almost 1100 mosques of 5100 nationwide became out of control for the government since the “Jasmin” Revolution in 2011. Tunisian government tries to get back the control of mosques fell into the hands of fundamentalists, organizing the joint committee of ministries of religion, interior and justice, and appointing newly Imams whom Ministry of Religious Affairs has approved. 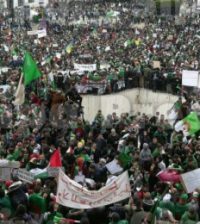 The majority of fundamentalist Imams were Tunisians who were radicalized under the suppression by the Ben Ali regime, or educated in foreign countries such as Iraq, Syria and Afghanistan. The Tunisian moderate Islam was marginalized pushed by the extremism which was empowered in the political and social turmoil in the post revolutionary period. Another agreement concluded between Morocco and Tunisia in March 2014 was a part of supporting the Tunisian reform in the religious field. The main activity mentioned in this agreement was the education of Tunisian Imams in Morocco. Libya did not make an exception. Morocco has been supporting the education and supervision of Imans and management of mosques by the government of Libya. Notwithstanding the fact of being one of the founding members of Organization of African Unity, the predecessor of the African Union (AU), Morocco left AU in 1984 over Western Sahara issue. Since then Morocco has been the only African country that is not a member of AU. However, Morocco has put the great importance on its diplomacy with African countries since 2000. The cooperation in the religious field is one of the most important pillars of the Moroccan diplomacy in Africa as well as the multilateral cooperation for the stability of Maghreb region and the recovery of the security of Sahel region. This Moroccan approach in fighting against terrorism in its security, religious and socio-economic aspects, was highlighted late September 2014 at the United Nations during a high-level meeting of the UN Security Council’s Counter-Terrorism Committee (CTC)The Moroccan approach was presented during a high-level meeting on “Countering incitement to terrorist acts motivated by extremism or intolerance: Morocco’s approach and experiences of other African states” which was marked by the presence of the members of the Security Council and other UN member states. 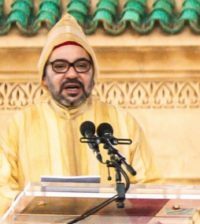 “Concerning the management of religious affairs, Morocco’s policy draws on the nature of the Moroccan regime itself which has been based, over ten centuries, on the fact that the Head of State, currently King Mohammed VI, derives legitimacy from his capacity as Commander of the Faithful,” the minister has stressed. The institution of the Commander of the Faithful which is solely responsible for protecting religion and managing religious affairs along with the logic of allegiance leave no room for any political project based on religion, Toufik pointed out . At the security level, Mohamed Yassine Mansouri, the General Director of Studies and Documentation (DGED), has genuinely elucidated Moroccan efforts for multilateral and bilateral cooperation at fighting against terrorism in all its forms. Stressing the multidimensional approach of Morocco on counter-terrorism, Mohammed Yassine Mansouri has clarified that this approach is not solely based on the security aspect, but goes beyond it to include a successful religious and spiritual strategy meant to promote an Islam version that extols the values of tolerance, otherness and moderation as well as a socio-economic aspect aimed at ensuring inclusive development which places the individual at the heart of all concerns . Following deteriorated security situation worldwide (Syria, Iraq, Libya, Yemen, Ukraine, Nigeria, Mali ,Egypt, etc.) Could have significant implications for all countries, and might lead to numerous changes in DOD plans and programs either in European, Middle Eastern, African or American agendas. Many indicators signpost, today, that several international forums such as G4, G20 and other global forums are seriously focusing their attention on international cooperation in the fighting against terrorism and intend to invite expertise from countries with such successful stories in fighting extremism.